DreamLight created the above series of 3D images for the Bose Automobile international advertising campaign. 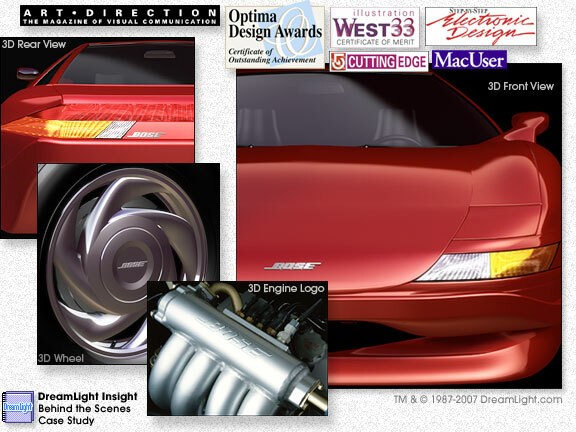 We custom designed the entire 3D automobile, completely from scratch. The only exception is the engine image, which is a 3D rendered logo merged with a photo, to keep within budget. For additional award-winning 3D samples, dont miss our 3D Rendering & Animation Portfolio. Id like to let you know in an official way how much I appreciate your hard work, dedication and talent on the recently completed Bose Car illustration. I was faced with a number of executional approaches: One would be to photograph many different cars and combine them into one image. This approach was flawed because our target audience is so sophisticated that they would certainly recognize a Honda tail light on a Nissan bumper, attached to a Ford body. Another approach would be to create the image using traditional photo-realistic airbrushing. This approach would not be fluid enough. It would be very difficult to make last minute changes. Not to mention I was not convinced that we could create an absolutely photo-realistic image with traditional airbrush. Enter DreamLight. We called you in, and gave you very broad parameters. Create an image of a car unlike any other. And deliver it in four weeks. This was the first time I had done business with you. I have to admit that I was very apprehensive. Basically, I needed a miracle in a month. And I was putting most of the burden on you. After I reviewed your first rounds of roughs, I knew I had made the right decision. You took the time to research the styling cues from a number of existing cars. You took these cues and combined them into an image that is very contemporary but very unique. Throughout the project, you communicated well, you were very flexible and you kept to your estimate. Not to mention you met the outrageous deadline! Thank you again for your dedication and talent. I am looking forward to creating the next image in the series with you. BOSE CORPORATION, THE MOUNTAIN, FRAMINGHAM, MA 01701-9168 U.S.A.